Whether you are celebrating, congratulating, or giving someone something special just because you care for them, we understand that picking the right gift is not an easy job. Scroll through our options of readily available gifting options for kids or lifestyle use. We also add seasonal products from time to time. Get in touch with us for customised options. Cheers! This magnetic board is a multi tasker. Younger kids - can learn to write their numbers and alphabets, while scribbling and doodling on this! Older Kids - helps them keep on schedule and maintain their to do lists! Mums - helps you maintain a reward chart for the child for a habit/task you would like to inculcate. 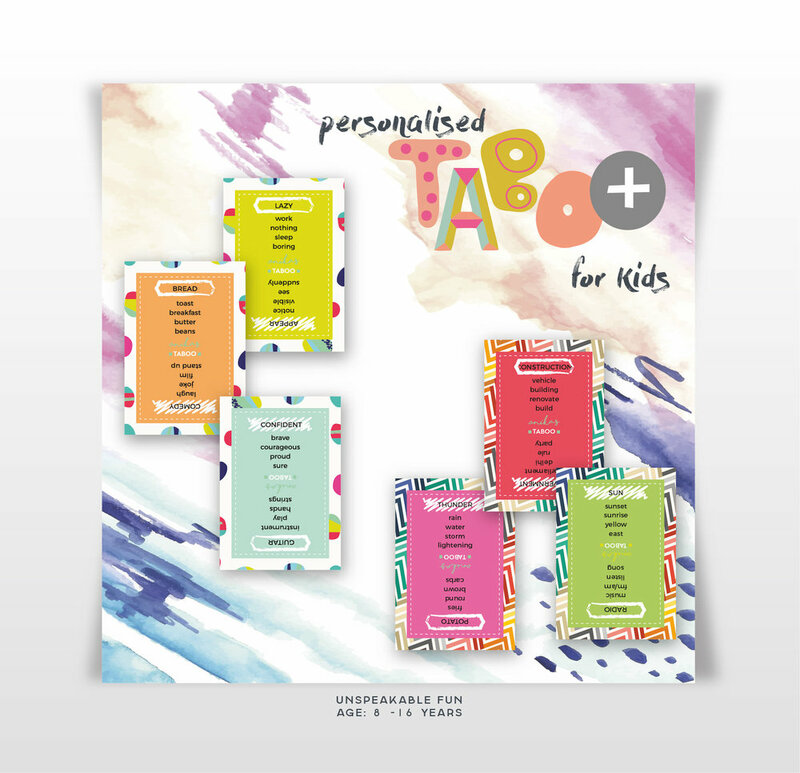 Use the magnets to stack up notes, reminders or school slips. it surely is your go to board in the kids room! Comes with 1 dry erase marker and a set of 6 concrete magnets. 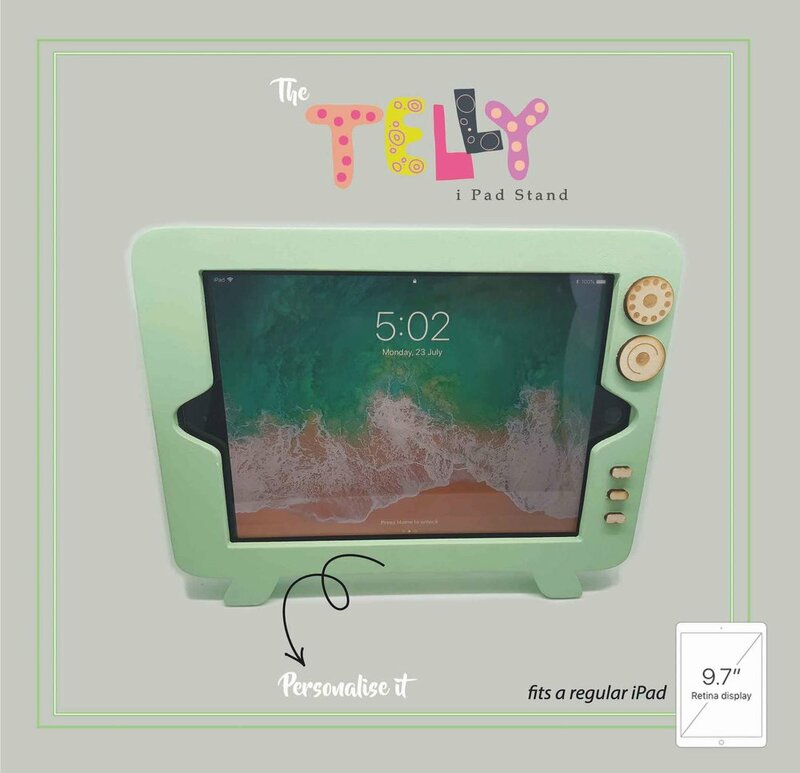 Slide in your tablet and let's the kids watch it hands free. Make meal times fun or the daily hour of iPad watching enjoyable. The most recognised men's accessory - cufflinks. The natural Stone with gold lining on the edges makes it a statement piece. Each piece is hand crafted and cut and variation is natural. Personalised hamsa stackable bracelet with beautiful enamel band (hot pink) , makes a perfect gift for your sisters and Bhabhi’s this Rakhi! Don’t wait, order your gifts today! Made with 24k gold plating, pure enamel and original Swarovski stones. Gift those growing brains the excitement of a Personalised Taboo. Especially designed for the kids between the age of eight and sixteen. Words chosen will help them build their vocabulary, enhance their English and thinking process. Gift these mini xoxo’s to your siblings and get their childhood back! Presenting to u our xoxo for your sibling. 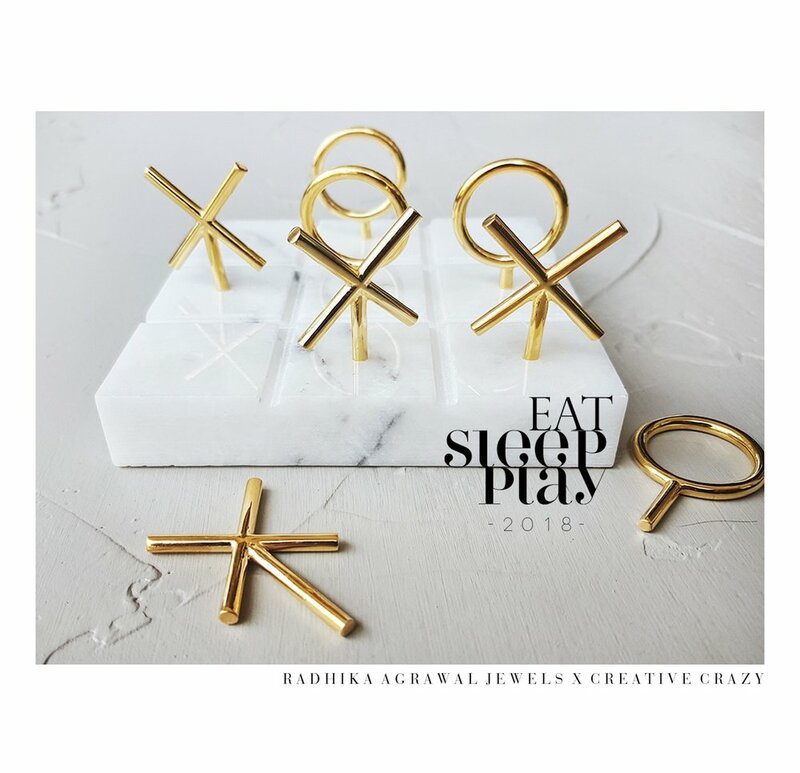 Handcrafted from the best of the marble and brass for your loved ones office desk or flaunt them as center pieces on conference tables as stress busters. Book/order now and get in time before Rakhi! Personalised pineapple stackable bracelet with beautiful enamel band (teal blue) , makes a perfect gift for your sisters and Bhabhi’s this Rakhi! Don’t wait, order your gifts today! Create instant joy when you give a gift in this adorable flamingo print gift bag from Creative Crazy. This bag is the perfect size for any small to medium gift, and you won't have to spend a single moment searching for tape or scissors. No mess, no fuss - a gift bag makes gift wrapping quick and easy. Set of 3. Dimension : 16" x 12" x 4"
Create instant joy when you give a gift in this adorable City Life print gift bag from Creative Crazy. This bag is the perfect size for any medium to big gift, and you won't have to spend a single moment searching for tape or scissors. No mess, no fuss - a gift bag makes gift wrapping quick and easy. Create instant joy when you give a gift in this lovely watercolour patterned gift bag from Creative Crazy. This bag is the perfect size for any medium to big gift, and you won't have to spend a single moment searching for tape or scissors. No mess, no fuss - a gift bag makes gift wrapping quick and easy. Create instant joy when you give a gift in this lovely Unicorn patterned gift bag from Creative Crazy. This bag is the perfect size for any medium to big gift, and you won't have to spend a single moment searching for tape or scissors. No mess, no fuss - a gift bag makes gift wrapping quick and easy. Create instant joy when you give a gift in this adorable Unicorn print gift bag from Creative Crazy. This bag is the perfect size for any medium to big gift, and you won't have to spend a single moment searching for tape or scissors. No mess, no fuss - a gift bag makes gift wrapping quick and easy. Create instant joy when you give a gift in this adorable ice cream print gift bag from Creative Crazy. This bag is the perfect size for any small to medium gift, and you won't have to spend a single moment searching for tape or scissors. No mess, no fuss - a gift bag makes gift wrapping quick and easy. Create instant joy when you give a gift in this adorable City Life print gift bag from Creative Crazy. This bag is the perfect size for any small to medium gift, and you won't have to spend a single moment searching for tape or scissors. No mess, no fuss - a gift bag makes gift wrapping quick and easy. Create instant joy when you give a gift in this adorable Unicorn print gift bag from Creative Crazy. This bag is the perfect size for any small to medium gift, and you won't have to spend a single moment searching for tape or scissors. No mess, no fuss - a gift bag makes gift wrapping quick and easy. Create instant joy when you give a gift in this lovely emerald agate patterned gift bag from Creative Crazy. This bag is the perfect size for any small to medium gift, and you won't have to spend a single moment searching for tape or scissors. No mess, no fuss - a gift bag makes gift wrapping quick and easy. Wrap your gifts in the City Life Gift Wrap from Creative Crazy and your friends and family will delight in the presentation of their gifts as much as the item within. This gift wrap has a traditional feel, but with a shiny finish that gives it a modern update. Let the bold pattern stand on its own, or pair with a simple or fancy ribbon for your own customized look. Wrap your gifts in the Unicorn Gift Wrap from Creative Crazy and your friends and family will delight in the presentation of their gifts as much as the item within. This gift wrap has a traditional feel, but with a shiny finish that gives it a modern update. Let the bold pattern stand on its own, or pair with a simple or fancy ribbon for your own customized look. Create instant joy when you give a gift in this adorable lama print gift bag from Creative Crazy. This bag is the perfect size for any medium to large gift, and you won't have to spend a single moment searching for tape or scissors. No mess, no fuss - a gift bag makes gift wrapping quick and easy. Create instant joy when you give a gift in this lovely emerald agate patterned gift bag from Creative Crazy. This bag is the perfect size for any medium to big gift, and you won't have to spend a single moment searching for tape or scissors. No mess, no fuss - a gift bag makes gift wrapping quick and easy. Create instant joy when you give a gift in this lovely Zig Zag patterned gift bag from Creative Crazy. This bag is the perfect size for any medium to big gift, and you won't have to spend a single moment searching for tape or scissors. No mess, no fuss - a gift bag makes gift wrapping quick and easy. Create instant joy when you give a gift in this lovely chevron patterned gift bag from Creative Crazy. This bag is the perfect size for any medium to big gift, and you won't have to spend a single moment searching for tape or scissors. No mess, no fuss - a gift bag makes gift wrapping quick and easy. Create instant joy when you give a gift in this adorable lama print gift bag from Creative Crazy. This bag is the perfect size for any small to medium gift, and you won't have to spend a single moment searching for tape or scissors. No mess, no fuss - a gift bag makes gift wrapping quick and easy. Create instant joy when you give a gift in this lovely watercolour patterned gift bag from Creative Crazy. This bag is the perfect size for any small to medium gift, and you won't have to spend a single moment searching for tape or scissors. No mess, no fuss - a gift bag makes gift wrapping quick and easy. Wrap your gifts in the Lama Gift Wrap from Creative Crazy and your friends and family will delight in the presentation of their gifts as much as the item within. This gift wrap has a traditional feel, but with a shiny finish that gives it a modern update. Let the bold pattern stand on its own, or pair with a simple or fancy ribbon for your own customized look. Wrap your gifts in the Zig Zag Gift Wrap from Creative Crazy and your friends and family will delight in the presentation of their gifts as much as the item within. This gift wrap has a traditional feel, but with a shiny finish that gives it a modern update. Let the bold pattern stand on its own, or pair with a simple or fancy ribbon for your own customized look. These fun and modern pink and white children's wooden clothes hangers are not only stylish but a great alternative to plastic or wire hangers. These gorgeous wooden laser cut clothes hangers come in the shape of a little girl's head with hand painted features and a display a very stylish colour palette. With their unfussy, modern design they look fabulous has room and wall decorations as well as being lovely little clothes hangers. Small imperfections are unavoidable as they are handmade which makes each hanger perfectly unique to the other. Each hanger is sanded, hand painter, sanded again and painted again. These fun and modern Superhero children's wooden clothes hangers are not only stylish but a great alternative to plastic or wire hangers. These gorgeous wooden laser cut clothes hangers come in the shape of superhero symbols with hand painted features and a display a very stylish black and red colour palette. With their unfussy, modern design they look fabulous has room and wall decorations as well as being lovely little clothes hangers. Small imperfections are unavoidable as they are handmade which makes each hanger perfectly unique to the other. Each hanger is sanded, hand painter, sanded again and painted again. Glamorous desk accessories are a necessary luxury. The pieces in our Acrose collection-- which mix clear acrylic with rose gold accents will inspire your personal best, every hour of the workday. Material: Acrylic and Rose gold coated metal. Imported. 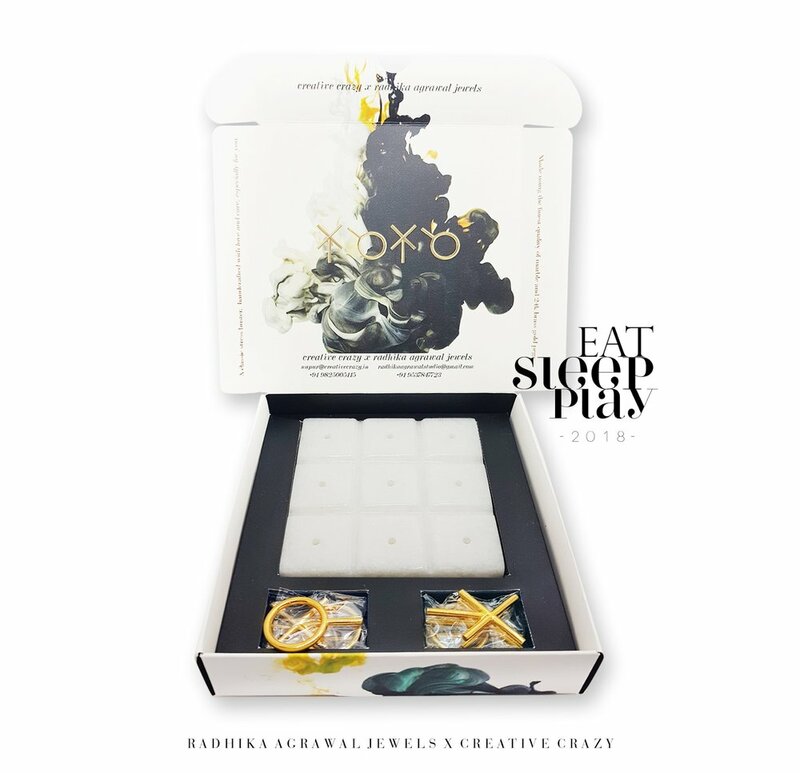 Comes in a beautifully handcrafted gift box. Personalisation available on the box and the memo block. Made from the finest pinewood. The burst of color on the sides and the handles adds a vibrant hue. A full board (11.5") of Pine wood makes a dramatic serving platform for cheeses and other small bites. Gourmet up your table finished with a pop of color on the sides. Choose from mint green, yellow or gold to spark up your dining tables. Use it as centrepieces with candles, taillights, cakes or just moth freshners. Available in different shapes. Warm, beautiful copper fashions a sleek handle that skims the rim of gorgeously grained pine wood. Makes a fantastic presentation of drinks or appetizers, especially when paired with the right cheese knives and food. Each natural wood tray will exhibit its own unique graining and color variations. The board carries an attractive dark brown shade, making it an attractive piece of home decor to go with its function. It makes the perfect gift for the holidays, weddings, bridal showers, anniversary, couple's housewarming parties, or a best friend birthday. Or simply use it as your own presentation piece for tastefully presenting cheese platters, breads, pizzas, sushi and more to guests. These are with stands.Each natural wood tray will exhibit its own unique graining and color variations. There may even be cracks in the Barks which add to the natural and rustic charm of the product. Beautiful antique style scissors in gold. Perfect for manicure, decoration, cutting craft materials such as tapes or paper or any other handmade project you can think of. 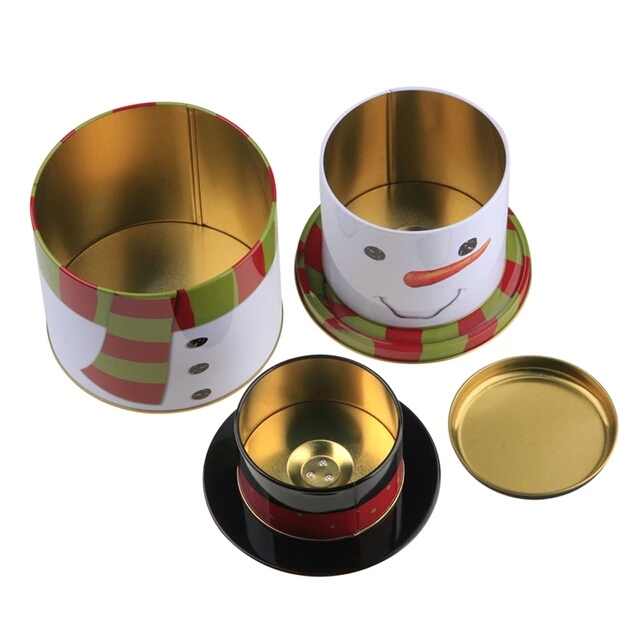 Creative folding combination of 3 tins. 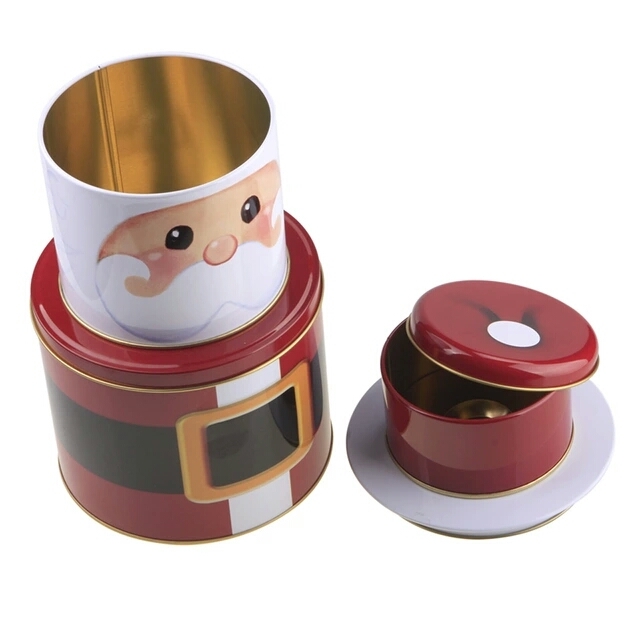 Santa Claus Design.Use it to store candies, cookies or knic knacks. A perfect gift this christmas for your loved ones.